- Learn how to define integrated project delivery and identify how technology can support teams engaged in highly collaborative processes. 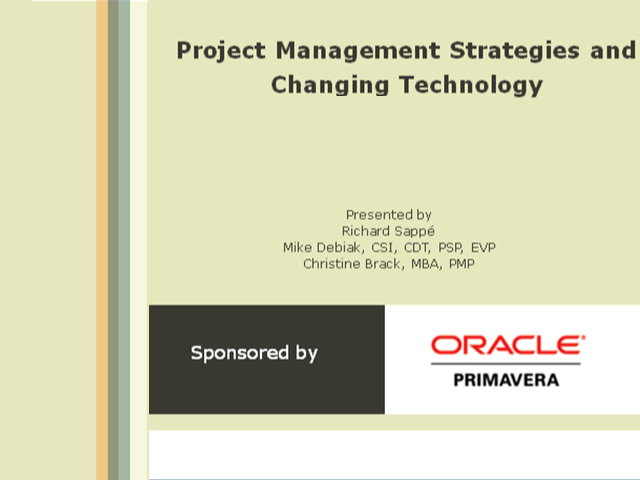 - Explore the relationship between project management and technology using several case studies to show how issues such as project scale, integration, the learning curve, and pace of adoption can influence outcomes. - Easily identify which leadership skills and abilities are increasingly important today and be prepared to replace hierarchical teams with collaborative-decision making and incorporate value management exercises on your projects. The world of ERP is evolving quickly. As project-intensive businesses grow and their resource management processes become increasingly complex they are turning to ERP solutions to help manage their entire project portfolio lifecycle. When properly implemented these solutions allow businesses to make better informed decisions regarding their portfolio management, to better evaluate the risks and rewards of their projects, and to determine if their resources are sufficient to reach accommodate their goals. As new and more agile solutions arise so do unexpected challenges and obstacles. Join informed and experienced experts to discuss how making the right choices regarding ERP can drive and increase in ROI. Join this expert panel discussion and hear how going green impacts project management and also how effective project management, using available tools and technologies, can result in more of your projects earning LEED certification. Welcome to the Oracle Primavera resource center. Oracle Primavera offers best-in-class solutions focused on the mission critical PPM requirements of key vertical industries including engineering and construction, public sector, aerospace and defense, utilities, oil and gas, manufacturing and high tech, and IT and services.